Studio 317, one of four composition studios at the C-PEMC, circa 1970. Clockwise from the center front, Vladimir Ussachevsky (seated), Milton Babbitt, Bülent Arel, Pril Smiley, Mario Davidovsky, Alice Shields, Otto Luening. Posted on December 17, 2013 Full size 461 × 321Leave a comment on Studio 317, one of four composition studios at the C-PEMC, circa 1970. 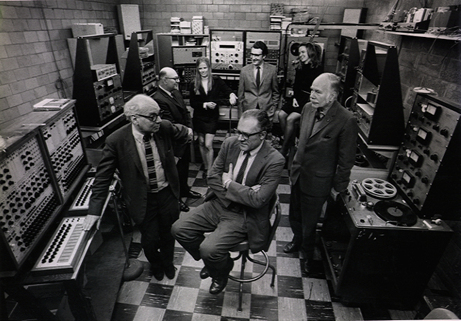 Clockwise from the center front, Vladimir Ussachevsky (seated), Milton Babbitt, Bülent Arel, Pril Smiley, Mario Davidovsky, Alice Shields, Otto Luening.